Fluent spotlights the emerging methods, tools, and technologies of the Web Platform. Developers, software engineers, UX/UI designers, and other web professionals come to Fluent to share their experiences and expertise—and to learn what they need to know to stay competitive. Meet the brightest minds in web development. 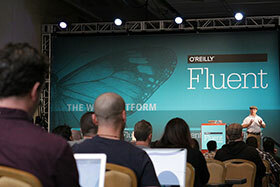 Fluent attracts the leading experts and innovators in every facet of the web platform. Over 75 speakers will share their hard-won expertise with you. You’ll have the chance to ask questions specific to your projects during Office Hours and Flocks. And you’ll interact with hundreds of your peers—web professionals who are facing (and conquering) the same problems you face every day. Get even better at what you do. At Fluent, you’ll learn what works (and what doesn’t) in the real world. With case studies and tales from the trenches, you’ll learn best practices, save time, and dodge the pitfalls that have vexed others. Solving just one gnarly problem will more than pay back the cost the conference. Think about your biggest work headache and then scan Fluent’s agenda. Odds are you’ll find the answers you need. The speakers are all excellent and inspirational. I was exposed to information that I would have had difficulty finding on my own and that will be useful to me in the future." My team relies on Fluent to select technologies, frameworks, and to keep informed about what's new in Web Development. It is definitely a productivity booster for us." To help support technology education and diversity, while Fluent registration is open, we're raising funds for Code.org, a non-profit dedicated to expanding participation in computer science by making it available in more schools, and increasing participation by women and underrepresented students of color. We ask that you consider joining us in supporting this worthy organization by making a modest donation when you sign up. O'Reilly Media will match those donations at the end of the conference.